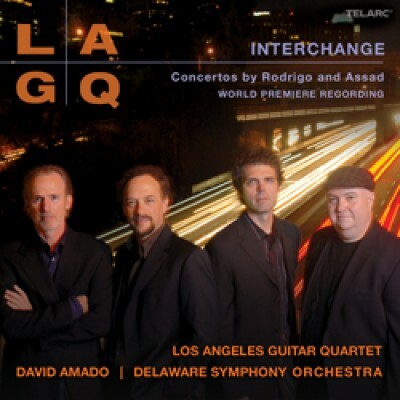 Telarc International is pleased to announce the world premiere recording "Interchange, Concertos by Rodrigo and Assad" featuring the Los Angeles Guitar Quartet, with the Delaware Symphony Orchestra conducted by Maestro David Amado. This release marks the first concerto recording by the GRAMMY®-winning LAGQ, and traces an arc from their instrument's first concerto to its newest one: Joaquín Rodrigo's Concierto Andaluz and Sergio Assad's Interchange. Recorded in May 2009 at the historic Grand Opera House in Wilmington, DE, Interchange marks the Delaware Symphony's debut recording. The CD will be released March 23, 2010. "Without the tremendous dedication of David and the DSO, this project never would have been possible," says LAGQ member Bill Kanengiser. "They worked hard to secure the funding for the recording, found rare ethnic percussion instruments to get just the right folkloric sounds called for in the score, and even had the city block off traffic near the hall to ensure a quiet studio environment!" 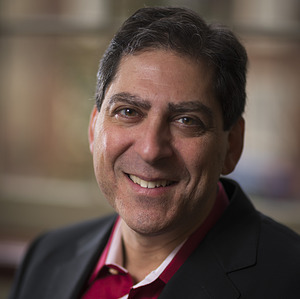 The quartet - also comprised of guitar virtuosi John Dearman, Matthew Greif, and Scott Tennant - had an instant rapport with Amado, sharing a love of Latin music, Spanish wine, and Italian espresso. Kanengiser continues, "We had a fantastic time working, playing, and drinking coffee with him!" LAGQ's recording of Rodrigo's Concierto Andaluz is a tribute to their mentors, Los Romeros, for whom the piece was written in 1965. One of the first concertos written expressly for guitar quartet, this quintessentially Spanish work has long been in LAGQ's repertoire, and their relationship with its composer goes back to their student days. They performed in a master class for Rodrigo in 1982 at USC, and have played the Andaluz at venues including such as the Hollywood Bowl,, on "Evening at Pops", and at Rodrigo's 100th birthday celebration at the Aranjuez Castle. They first performed it with Amado and the Delaware Symphony in 2007. Also featured on this project is a world-premiere recording of a major new work, Sergio Assad'sInterchange for Guitar Quartet and Orchestra Brothers duo, and long-time friend of LAGQ. He has written and arranged for artists like Yo-Yo Ma and Nadja Solerno Sonnenberg, and won a Latin GRAMMY® in 2008 for Best Classical Composition. Written by Assad specifically for the LAGQ, it was first performed at the UTSA Southwest Guitar Festival on Feb 6, 2009. "Interchange represents my intentions of using traditional musical styles of the world blended as a whole organic unit, while at the same time suggesting a casual meeting of different people on an LA freeway," Assad explains. "The titles [of the movements] all have a sort of 'double meaning' with the musical styles and references to roads and driving." The Brazilian composer - with more than 50 works for guitar to his credit - wrote each of the first four movements specifically for a member of LAGQ. He highlighted each player with a blend of musical styles - inspired by their individual personalities and tastes in music - ranging from Jewish, Spanish, Asian, contemporary jazz, and Brazilian and American blues influences. The concerto culminates in a final fifth movement, Crossings, which was which was partially inspired by the "Four Level Interchange" near downtown LA. Evoking the structure of the world's first stack freeway interchange, it begins with an extended cadenza for the guitars that combines and interweaves themes of all four movements, culminating in a rousing orchestral finale. "Interchange grew out of my view of the LAGQ's great ability to blend different musical styles into a unique and novel interpretation," says Assad, who first met the quartet at USC in 1982 and whose Uarekena appears on their GRAMMY®-winning Guitar Heroes recording (Telarc). "It was a long-held dream of mine to compose a substantial piece with orchestra for the LAGQ." The Los Angeles Guitar Quartet has been lauded by the Los Angeles Times for its "unrivaled joy, technical élan, and questing spirits." Of a live performance of Interchange, the Santa Barbara Independent praised, "...A smashing job...Festive virtuosity."